Drifting in the dark waters of a mysterious river, the only thing Amelia knows for sure is that she’s dead. With no recollection of her past life–or her actual death–she’s trapped alone in a nightmarish existence. All of this changes when she tries to rescue a boy, Joshua, from drowning in her river. As a ghost, she can do nothing but will him to live. Yet in an unforgettable moment of connection, she helps him survive. 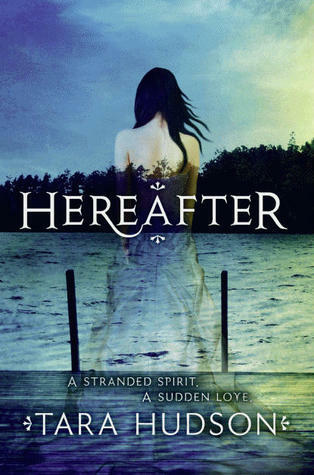 Thrilling and evocative, with moments of pure pleasure, Hereafter is a sensation you won’t want to miss. Scrap ‘it was okay’ this book was drop dead gorgeously ghastly. Normally I give my own synopsis of the book, but I can’t bring myself to write it. Yes, it was that BAD. I’m not a big fan of giving out low ratings but lets be honest here, WHERE IS THE PLOT?! Sure, their were a few complications here and there but there wasn’t anything I could classify under ‘plot’. The closest I’ll go for plot making was the end. It was fast paced and my favourite part of the book. Amelia, our protagonist is weak for a girl who’s supposed to be brave, she cried twice within 20 pages and both issues very unnecessary. I found Amelia really hard to relate to, not because she’s a ghost but because she is unrealistic and pretty hysterical. Joshua is better, apart from his love for Amelia, Josh is the typical, ‘perfect boy’ at school, I find those sort of people hard to relate to but Tara did pretty well. I’m not sure if I’ve made myself clear in some other reviews, INSTANT LOVE IS ONE OF MY BIGGEST PET PEEVES! Amelia: Oh no! A hot guy drowning, I must save him! Seriously, I don’t get her. Then a couple of days later, they meet and are instant soul mates for life. All in all, I found Hereafter really plain and plot less, I was expecting more and was disappointed. But if you already have this on your TBR, go for it, because there are so many mixed reviews on this.